I find this really offensive: making a mockery of the solemn oath of office. Peter Micallef takes swears his solemn oath in full knowledge that he is going to undo it in five minutes by resigning his seat. This is like making your vows in a marriage ceremony on Monday when you intend to file for divorce on Tuesday. I just can’t understand how these things are allowed to happen, and worse, how they are treated as normal and the solemn oath as just a routine form-filling step of no particular significance. I am so disgusted I can’t tell you. And then what is this mockery of the oath for? 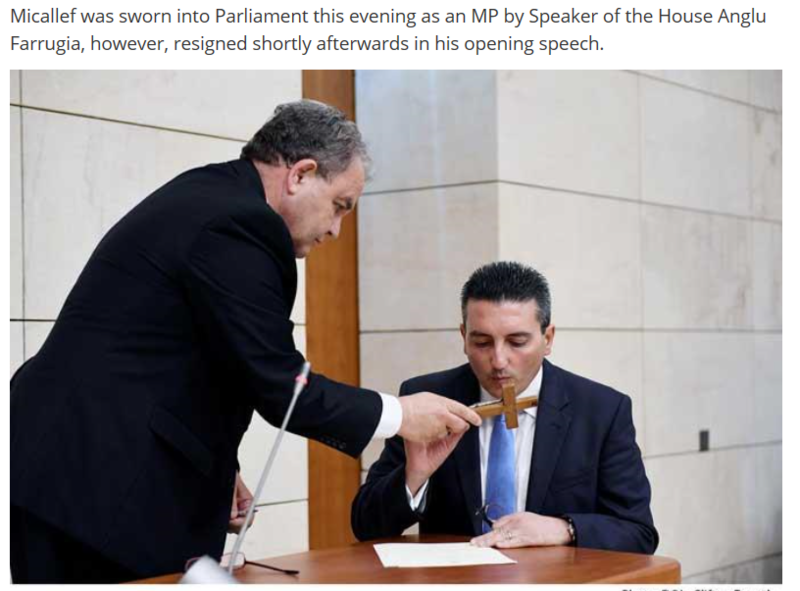 So that an unelected former money-launderer for a London prostitution racket can acquire a seat in parliament and become leader of the Opposition, in yet another two-fingered salute to Maltese democracy.